SeaWorld initially opted to mostly ignore a critical documentary but it’s changed course and mounted an aggressive campaign to defend itself. For months, SeaWorld seemed to hope a surge of bad press and protests surrounding a controversial documentary would fade away. Then a wave of high-profile entertainers canceled appearances at the company’s marine parks late last year and SeaWorld decided it couldn’t stay silent about “Blackfish” any longer. 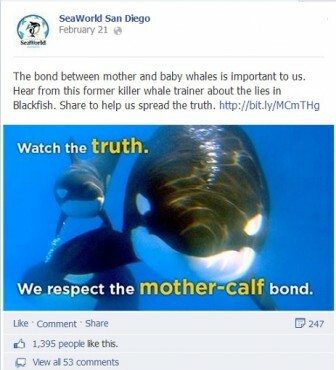 The company launched an aggressive media campaign of persistent anti-“Blackfish” social media posts, polished videos featuring SeaWorld employees and full-page ads in some of the nation’s largest newspapers. But what message is SeaWorld projecting? Here are some key takeaways from SeaWorld’s anti-“Blackfish” offensive. SeaWorld wants you to know “Blackfish” pushes an agenda. The marine park created a web page to address the movie. A 1,700-word analysis – titled “Why ‘Blackfish’ is Propaganda, not a Documentary” – plays prominently there. SeaWorld’s rebuttal notes that several of the experts interviewed in the film have aggressively campaigned against holding whales in captivity for years, and that three joined People for the Ethical Treatment of Animals in a 2011 suit against SeaWorld that accused the company of violating killer whales’ constitutional rights (the suit also listed those whales as plaintiffs). A judge dismissed the case. And former SeaWorld senior trainer Mark Simmons, who has defended SeaWorld in the past and was interviewed in the movie, spoke out about filmmakers’ approach in three videos on the “Truth About Blackfish” page. In another video, Simmons says that much of what he told the filmmakers was left out of the movie. SeaWorld aims to undermine the documentary’s credibility. The primary goal of SeaWorld’s “Truth About Blackfish” page is to pick the movie apart. Four of the six videos on SeaWorld’s “Truth About Blackfish” page emphasize misleading elements of the movie and they get the majority of ink in the theme park’s write-up about the film too. • SeaWorld criticizes the use of “emotionally manipulative” footage of killer whales being captured in the wild. The company has also contended that it hasn’t seized orcas this way in more than 35 years. • The theme park also points out missing context in “Blackfish” footage of two whales separated from their mothers, scenes that are particularly troubling because calves stick with their moms throughout their lives. SeaWorld says one of the calves removed from its mother’s care was 12 years old and the other, a 4 ½-year-old orca, was disruptive to her mother and other whales. “We do not separate killer whale moms and calves, and in the rare occurrences that we do move whales among our parks, we can only do so in order to maintain a healthy social structure,” SeaWorld writes. Chief SeaWorld animal trainer Chuck Tompkins takes up the same point in a video. • In another video, Orlando-based killer whale trainer Holly Byrd pans the documentary’s use of footage of her first time getting into the water with a whale. “Blackfish” paired the video of Byrd with a former trainer’s description of her first time riding an orca. Byrd believes viewers could have been misled to believe she was the ex-trainer who was speaking as footage of her played. “One thing that I want people to know after watching the movie is that it’s not true,” Byrd says. SeaWorld took its argument that “Blackfish” is deceptive offline this week when it filed a complaint with the U.S. Labor Department. The company accuses an Occupational Safety and Health Administration investigator whose probe of SeaWorld was discussed in the movie of ethical violations, including sharing confidential information with one of the movie’s producers. SeaWorld contends there’s some value in captivity. But for how much effort SeaWorld expends chipping away at specifics within “Blackfish,” it devotes far less time to the film’s overarching contention: that orcas don’t belong in captivity. SeaWorld does address concerns about orcas in captivity in some of the videos on its main anti-“Blackfish” page and in a few separate locations on its website. In one video featured on the page about the movie, Tompkins says observing killer whales in a zoological setting allows scientists to study them in far more detail than they ever could in the wild. In another video, SeaWorld Orlando’s head animal trainer talks about the bond between trainers and orcas and how young visitors are inspired to care for oceans and animals after a trip to SeaWorld. A separate page dubs SeaWorld a “global leader in the care, behavior and enrichment” of killer whales and describes the company’s careful attention to detail on everything from the filtered saltwater in the orca’s SeaWorld habitats to preventive medicine. Another post provides more details on SeaWorld’s killer whale research. Poke around SeaWorld’s anti-“Blackfish” site a bit more and you’ll also find four videos featuring employees talking about the park’s animal conservation and rescue efforts, as well as its care for its animals and how interactions with them inspire visitors. SeaWorld is waging an aggressive social media war – but it’s not clear the company is winning. SeaWorld is clearly investing heavily in promoting its message on Twitter and Facebook. Since at least January, I’ve seen paid-for tweets like this daily. And Facebook posts like this. SeaWorld doesn’t appear to have much of a choice. 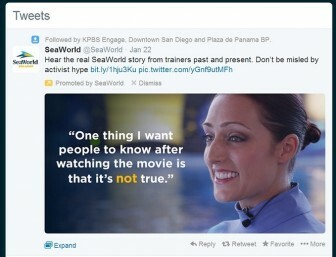 Last November, Twitter blogged about a colossal wave of response from “Blackfish” supporters and viewers. In the months since, SeaWorld has tried to fight back but those won over by the documentary flood each PR push with negativity. It doesn’t help that viewers can watch the film on Netflix anytime and that it’s aired repeatedly on CNN, leaving SeaWorld to deal with a constant flow of criticism. SeaWorld is fighting hard but the battle is likely to continue for some time. This is part of our Quest: SeaWorld series digging into the park’s impact on our region. Check out the previous story – 5 Big Claims ‘Blackfish’ Makes About SeaWorld – and the next in our series – SeaWorld San Diego, By the Numbers.